(CNN) -- South African sprinter Oscar Pistorius is said to be 'fine' after requiring surgery in Johannesburg on head and facial injuries sustained in a boating accident. 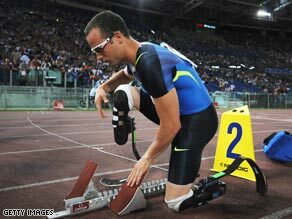 Pistorius is still expected to compete at the Paralympic World Cup in May despite his boating accident. The 22-year-old double amputee, known as Blade Runner due to his prosthetic legs, was with friends on the Vaal River when his boat hit an unknown object. Four-time Paralympic champion Pistorius, who won an appeal to compete in the Beijing Olympics but subsequently failed to qualify, was stabilised by paramedics at the scene before being airlifted to Millpark hospital in Johannesburg. Principal medical officer Anchen Laubscher said in a statement on Pistorius' official Web site, www.oscarpistorius.co.za: "He is fine. Everything can be repaired surgically. His brain is functioning normally. He will soon be discharged and taken home to make a full recovery." Pistorius' manager Peet van Zyl added the sprinter still plans to compete in the 100 meters and 400 meters at the Paralympic World Cup in Manchester in May. "Oscar will be back on the track sooner rather than later," Van Zyl confirmed. "He has sustained no leg, arm or rib damage."